After becoming Ranveer Singh’s biggest opener with a collection of Rs 20.72 cr. 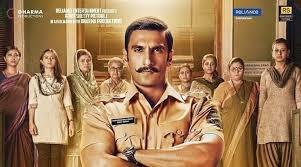 on Day 1, Simmba is all set to surpass Bajirao Mastani to become the actor’s 2nd highest grosser of all time, trade analyst Taran Adarsh revealed. Ever since its release, Simmba has been breaking box office records. The film is also Rohit Shetty’s eighth consecutive release to enter the Rs 100 cr. club. Ranveer Singh remarked that Rohit Shetty knows his trade too well. He said, I also think he knows the trade because he is a bonafide big screen director. He is the one who gets the audience to the seats. He is the one who is shot in the arm when the footfall is falling. So, yes, as an audience and an actor who has collaborated with him I appreciate him in every way.